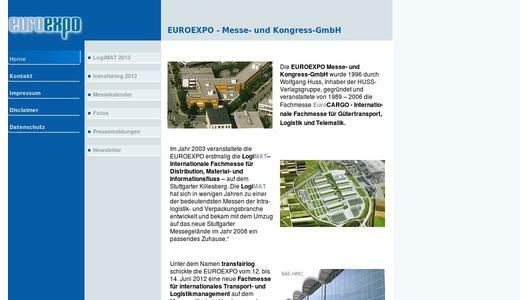 On 19 February 2013, at LogiMAT, the International Trade Fair for Distribution, Materials Handling and Information Flow, the winners of the "Best Product Awards" were announced. The award ceremony took place this year for the first time as part of the official opening ceremony to the event, in front of a large audience in the exhibition hall. The winners welcomed the organiser's new concept for presenting the awards at the start of the opening day, as they were able to promote themselves as winners of these acclaimed awards, straight after the ceremony, at their exhibition stands. This year, too, all the entries for the competition were examined in detail, ahead of the show, by a seven-strong independent jury of trade journalists and professors. In line with the conditions for the awards, the jury chose the winning products in the categories of "Procurement, handling, storage", "Order picking, packaging, protection" and "Software, communication, IT". Jury member Professor Dr.-Ing. Willibald A. Günthner, Chair for Material Handling Technology, Material Flow and Logistics at the Technical University of Munich, delivered the jury's summary and review. 1. In the category "Procurement, handling, storage" the winner was industrie automation Engergiesysteme AG of March near Freiburg (Hall 8, Stand 123), for its lithium-ion energy system liflex for electric, battery-powered ground conveyors in the 24V range. This new lithium-ion based energy system gives long service both as regards lifetime and cycles, lasting around twice as long as a lead-based battery, which it replaces in just a few simple steps. Integrated into the battery pack is a battery-management system which monitors the cells individually and the battery as a whole; it prevents the limit values being exceeded, including during loading. The innovative liflex energy system has a significant effect on factors such as battery handling, maintenance, energy use, restrictions on applications, lifetime and productivity, bringing huge benefits to operators of vehicle fleets and users of electrically driven ground conveyors. The positive effects include an increase in efficiency, lower costs and an opportunity to further optimise intralogistics processes. 2. In the category "Order picking, packaging, protection" the winner was the Quick Pick(TM) Remote from Crown Gabelstapler GmbH & Co. KG of Munich (Hall 8, Stand 101/102). In order-picking operations involving the lowest shelf levels, 35 percent of the time is spent on walking from the shelf to the operator's platform, and 15 percent is spent on driving in the aisle. With Quick Pick(TM) Remote productivity can be significantly improved. The system combines a Crown low-level order picker with intuitive remote operation, integrated in a work glove. Using this, the operator can move his vehicle forwards at the push of a button without actually standing on the operator's platform, so he has both hands free. Measurements have shown that with the new system the jobs list can be finished up to 25 percent faster. The number of times the operator steps onto and off the platform is also reduced considerably. As well as speeding up the whole order-picking process, the easier working processes involved with Quick Pick(TM) Remote also have a positive effect on the wellbeing of the operator himself. 3. IPO.Plan GmbH from Leonberg (Hall 1, Stand 431) impressed the jury in the "Software, communication, IT" category with its 4D visualisation and planning software IPO.Eye. This new technology revolutionises product and process planning in manufacturing companies, through visualising complex relationships. The actual goal of "assembly planning" has so far involved long and complicated scanning processes and preparation of data for presentation in a 3D CAD model with which the planner was able to then carry out the actual planning work. Often external service-providers were commissioned to measure the assembly line and collect the data about all the shelves, load carriers and stations - all of which costs a lot of money. By eliminating this weeks-long data-collection stage, production can start earlier, and that of course brings significant cost-savings for the company. In particular the automotive industry has so far successfully implemented this software tool - which is unique worldwide - for planning and optimising assembly stations. The three winners of the Best Product Awards are exemplary of many other products and solutions on show at the stands of the exhibitors at LogiMAT 2013, on 74,000 square metres of space, spread over six exhibition halls. The 'Best Product' Award was launched ten years ago by the organiser of LogiMAT, as a way of highlighting the achievements of its exhibitors, many of which are small and medium-sized companies. However, the main focus of these awards is not size, but quality. The winners benefit from being able to use the award in the marketing of their products and solutions. Well known companies and the media are supporting the award, as partners. The winners of the competition receive a medal and a certificate.